About Every Projector Lamp - All Makes, All Models - Next Day Delivery. 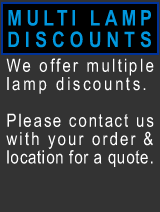 Our head office is based in Edinburgh and we source lamps from a variety of European distributors. If you the lamp shown here is out of stock and you are in a hurry please contact us and we can check stock levels at alternative distributors. Prior to ordering a lamp you should ensure that the lamp is likely to be faulty - this will typically be indicated by a sequence of flashing LEDs - You will need to consult the manual to confirm this as sequences vary from model to model. If the projector has no lit LEDs it is unlikely that the fault is the lamp. We service every UK postcode and will happily despatch to Europe if required. European shipping is by arrangement. We offer our customers a secure payment facility via Google Checkout.